Although this book started straight in on the action, I was quickly able to relate to Ruth as a character. 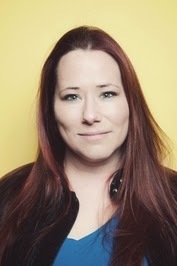 I could empathise with how she felt… and it was very much like I was experiencing the emotions she felt along with her. I didn’t really like the switching between first and third person. I didn’t think that was necessary… and each time it happened, I felt like I was pulled out of what was happening to Ruth. If it weren’t for that constant switching, I’d probably actually give this book five stars. The flashbacks didn’t really add anything extra to the story. There was a lot of false hope in this book, where I thought Ruth might be safe and then something happened that created tension again. I really liked the fact that she was a survivor… and I cheered internally when she made the conscious decision not to go upstairs, since that meant leaving safety. I felt that the author did a good job of showing Ruth being resourceful, while also keeping to what she could realistically do. It was good to see that she was affected by the elements and exposure. There were moments where I felt intense sympathy for her… and if I’m honest, I did think her dad was a bit of an idiot. I did think that some of the elements of foreshadowing that could have been in the book were lost in where the story started. 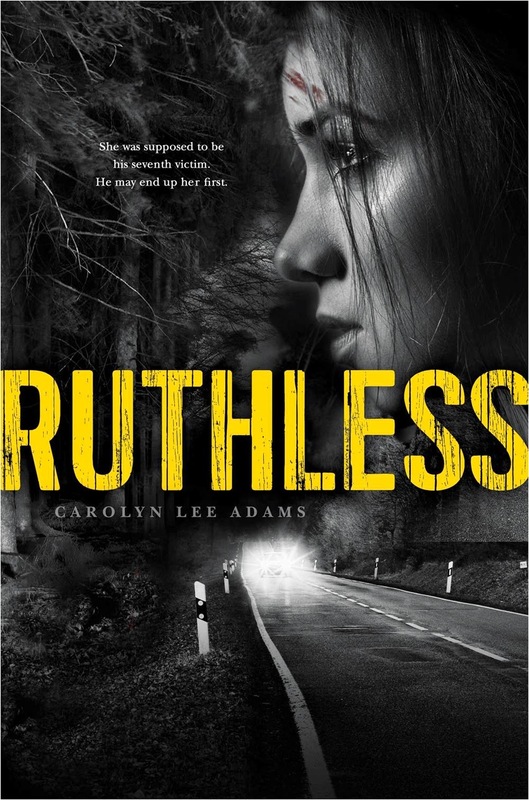 Rather than having flashbacks, I would have preferred the start of the book to show the relationship between Ruth and Caleb and her parents, as well as the rest of her family. There were a lot of really intense moments in this book. I winced along with Ruth at the pain she was in… but the adrenaline was really strong. It was good that Ruth was a survivor… and also good to see her grow in maturity through her ordeal. I think it would be good to read a sequel to this book. I’d like to see the aftermath of what happened and how much it’s changed the characters involved. I’d also check out more books by this author in the future. I CAN’T SEE. I DON’T know why I can’t see. I do know I was just dreaming. Running in a white dress through a field of wildflowers, no less. It was like a commercial for laundry detergent or tampons or a prescription medication that has death listed as a possible side effect. The dream is embarrassing, but it’s better than the here and now. I try to crawl back into the dream, but it won’t have me. Reality rushes in, faster and faster, chasing the dream away, replacing it with complete and utter darkness. I need to open my eyes. I don’t know anything else, but I know that. I try to open them. Thinking is hard and I know why. Concussion. My fourth one. First two came courtesy of falling off horses. The third was the result of a PE flag-football game gone awry. I forgot about the flags, tackled a guy three times my size. His heel cracked against my forehead, but he didn’t get the touchdown. Did I fall off Tucker? Somehow that seems wrong, seems impossible. I look for the memory, knowing it has to be around here somewhere. Tucker has an abscess in his right front hoof. He’s on stall rest. Did I fall off another horse? That doesn’t seem right either. But it seems the most likely. So what next? And why can’t I see? Check if anything is broken. I start with my toes. They wiggle. I can feel them. This is good. It seems they’re inside boots, so maybe I did fall off a horse. My legs are oddly stiff, like they’re too heavy to move. I try to bend a knee, but it isn’t happening. My right arm is a no go. There’s pain there. A lot of pain. It’s dulled by the concussion, but that arm is a sleeping bear I don’t want to prod. Luckily, I’m left-handed. The left arm isn’t hurt, but it also doesn’t want to move. Not as bad as the legs, though, or the injured right arm. I think this left arm can get me somewhere. Time to summon the will to move it. Take a deep breath. . . . Dirt falls into my mouth. Not dirt. Manure and shavings, something spiky. It’s hay. Hay and shavings and manure. I feel it now, pressing up against my neck and jaw, against my body and legs. It’s dangerously close to my nose, and it’s why I can’t move. It’s pressing down on me, pinning me in place. Adrenaline hits my bloodstream. I fight my left arm free, dig the muck away from my mouth, and take a swallow of clean air. Slow your breathing. Slow it down. Do it. Nothing but air. It’s all I think about for several minutes. I calm down, and the adrenaline ebbs away. I want to fall back to sleep. Sleep is soothing. Quiet. Peaceful. There’s a field of wildflowers on the other side of sleep. I have to fight the concussion. I need to open my eyes. Maybe the dirt was pressed against my eyes. Maybe that’s why I couldn’t see. Hope gives me new energy. I try again, and get nowhere. Maybe I don’t have eyes anymore. True fear now. For the first time. My thinking is clear enough for real, raw, primal fear to sink in. Time to be courageous. Time to check. But I don’t want to know. I take my left hand and reach for my eyes. There’s something weird there, but I don’t know what it is. It’s almost rough. But there’s definitely blood. Lots and lots of it. Sticky, heavy blood. I jerk my hand away and strike metal. There’s something metal above my face. The fear broadens into something deeper. I am in trouble. Dear God, I am in trouble. I don’t know what kind of trouble, but I know it’s bad. Do my parents know? Am I alone? I try to listen. Dirt muffles my hearing. My ears are halfway encased in the filth, but it seems like there isn’t anything to hear. Except a hum. A deep, resonating hum that overwhelms everything. Concussion. I know you well, old friend. Now kindly get the hell away from me. You may leave my hearing on your way out. A wave of nausea crashes over me. I don’t know where I am, but my best guess is somewhere on the ranch. Possibly under the manure pile. Was I in a tractor accident? Tractor chores are not my favorite. I lack skills, to put it mildly. But I won’t let that damn tractor win, so I drag the arena, push the manure pile back, and do all the things the hired hands do. Did I flip the tractor? No. Don’t call for help. Why not call for help? All right, no. Listen to your gut, my mom always says. And I do. It usually steers me right. Okay, now what? How do I figure out where I am? Time for my left hand to do some exploring. Weird how I’m thinking about my left hand like it is a separate person from me, a friend I can rely on. I reach out to touch the metal I felt before. It is a solid sheet, not far above my head. I trace a diamond-plate pattern with my fingertips. The farm has two tractors; both are smooth steel all over, except for the dirty roughness of the bucket. My tractor-¬accident theory is looking less likely. A few inches later and the metal makes a right-angle turn away from me—and my hand hits the dirty shavings. Only my head is underneath this thing. Whatever it is, it protected me from being smothered to death. Time to search my left side. Shavings. Manure. Hay. But then, close beside me, a pole of well-worn wood. I can feel the barely there ridges of grain in the oak. Pitchfork handle. This definitely feels like a pitchfork handle. I must be at the ranch. Where is there diamond-plate metal on the farm? I can’t remember. My left hand keeps going. The tips of my fingers touch more metal. This is something different, though. It’s rough and flaky with rust. I slide my hand along the old steel. It has a soft curve. Like a bowl. But it’s weird. Like the bowl is sort of shaking. It makes no sense. I reach out as far as I can, but lose contact with the metal. Searching higher, my fingers touch metal again. A little hook. Odd. Then a straightaway of more metal. Then another metal hook. Another straightaway. Another hook. I run out of arm. I am small and don’t have much length of arm to work with. So I trace the hooks and the straightaways back to the thing that’s like a bowl. This all feels familiar. Those metal hooks remind me of my dad tying down a tarp in the bed of his truck. I am in the bed of a truck! Why am I in the bed of a truck? I reach out again for the metal hooks. Something tickles my hand. Stretching as far as I can go, I feel it in earnest now—the wind buffeting the skin of my hand. The wind, hard and fast. How can that be? How can I be in a moving truck? I reach out again, to check if I’m hallucinating. No. It’s there; that biting, slapping wind is there. This truck is going fast. Then I feel the hum through my body. The hum in my ears isn’t just concussion. It’s a combination of engine and vibration. It’s metal movement. The diamond-plated thing above me must be a truck-bed toolbox. My head is in the empty space beneath it, protecting me from the shavings, keeping me alive. I know where I am now. I’m in the bed of a fast-moving truck, covered in blood, buried in filth. My right arm might be broken. I can’t see. Realization dawns, and I pull my hand in like I touched fire. Fear slides into my belly as I wait. Was I seen? Did someone see my hand? The truck shift gears. It’s slowing down. Quickly. 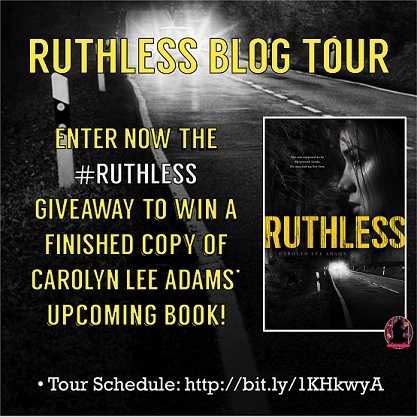 Follow the Ruthless by Carolyn Lee Adams Blog Tour and don’t miss anything! Click on the banner to see the tour schedule.